A rabbi was killed and four of his children were seriously injured late on Thursday night in a car crash that took place as the family drove home from a wedding. 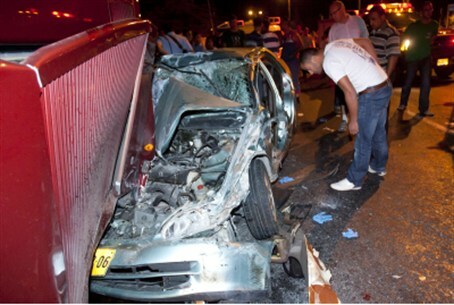 Rabbi Yosef Weizel, a member of the Vizhnitz Hassidic movement, was driving home from the celebration in Bnei Brak to his family’s home in Netanya when the crash occurred. An eyewitness said the family’s car swerved, hitting a large truck. The car slammed into the back of the truck and was trapped underneath. Rabbi Weizel was killed. His 14-year-old daughter, who was sitting in the front seat, suffered serious head injuries. Two young children in the backseat suffered serious head injuries as well, and the family’s youngest child was in moderate condition. The mother of the family and a fifth child were not in the car. Rabbi Weizel was buried Thursday evening. Thousands of people from across the country attended his funeral. He was eulogized by Rabbi Toissig, who spoke in Yiddish. “You are a real sacrifice… You were killed as you returned from a joyous event, as you wore your Sabbath clothes. Arise to heaven and ask G-d, ‘Forgive your people Israel,’” he said.